In just a few short days, all across the country, we will be brought together for one thing. Giving thanks. There are so many things to be grateful for this in this world, and one of the most important things for me (besides my family and friends) is the abundance of healthy food at our Thanksgiving table. 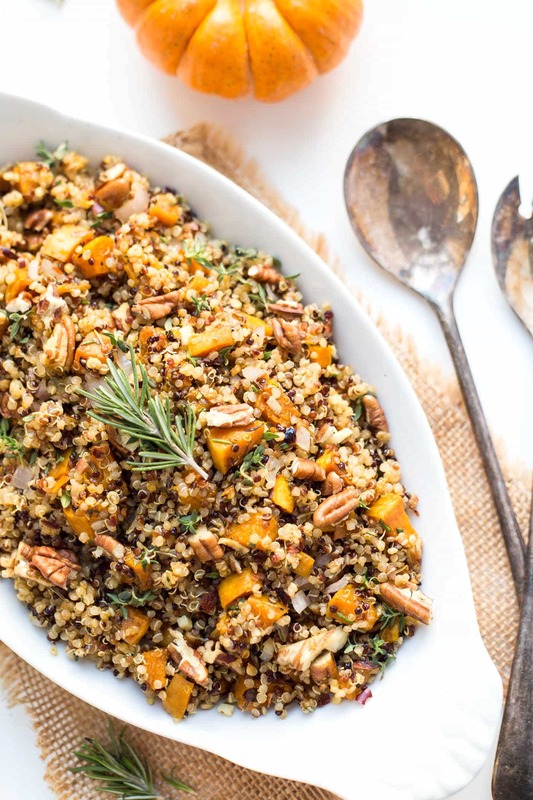 This year, I'll be bringing a few different things, but one dish that you can always count on from me is quinoa stuffing. I've been bringing the same quinoa stuffing for the past few years, and while it's super tasty, I felt like I could make it a bit more flavorful. 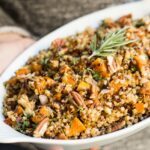 So today I'm sharing my updated quinoa stuffing recipe that uses a few new spices to make it even more delectable. The last recipe I made was fairly basic. Good, but needed more. It was based off a recipe I found years ago when I was still learning my way with quinoa, but now that I've had years of practice working with this lovely faux grain, my new-and-improved quinoa stuffing is just that. New. And improved. Much in part thanks to the edition of some new spices: rosemary, sage and thyme. I like using these dried, hearty spices in the recipe because you can add them to the roasting process and not worry about them getting burned. 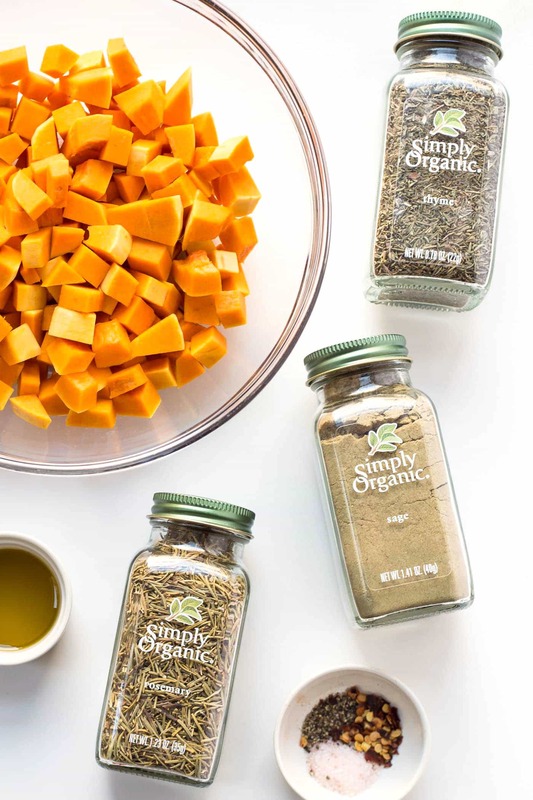 Simply Organic makes my favorite spices, so if you're looking to stock up, check out what they've got! 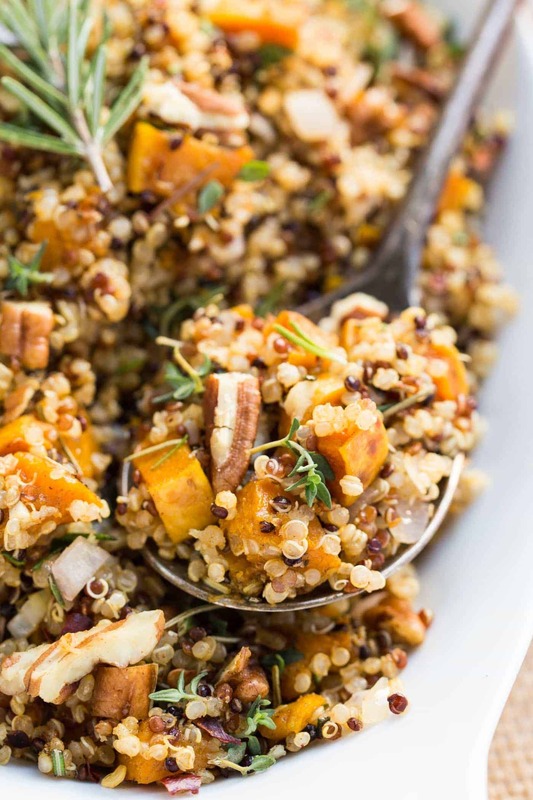 The base is tri-color quinoa which provides a little crunch, but also makes the dish pop with color. Then it's sweet potato (or butternut squash), shallots, garlic and spices, which are roasted up with a touch of olive oil. The potatoes add a creamy texture and sweet flavor, which pairs perfectly with the winter spices. To finish it off, we toss in some chopped pecans and fresh herbs for even more flavor. 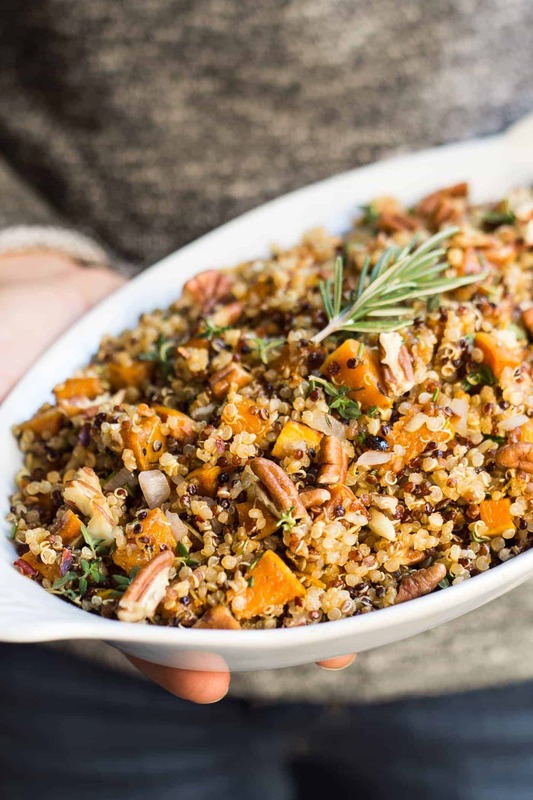 If you've been wondering about what to bring to this year's Thanksgiving feast, that is still traditional but also healthy, I'm telling you this quinoa stuffing is a must-make. It's also one of those recipes that you can make ahead of time and just warm up on the day of. Plus, for all you gluten-free eaters out there, this recipe is the perfect substitute for the classic Thanksgiving stuffing. It's light, flavorful and packed with all the standard ingredients. But, you won't find any bread here. It's simply my dear friend quinoa. Be ready to smile as you taste this heart-warming dish! Add quinoa and broth to a large pot. Bring to a boil, cover and reduce to simmer for 10 - 15 minutes until all the broth as been absorbed. Remove from heat, fluff with a fork and allow to cool while you prepare the remaining ingredients. 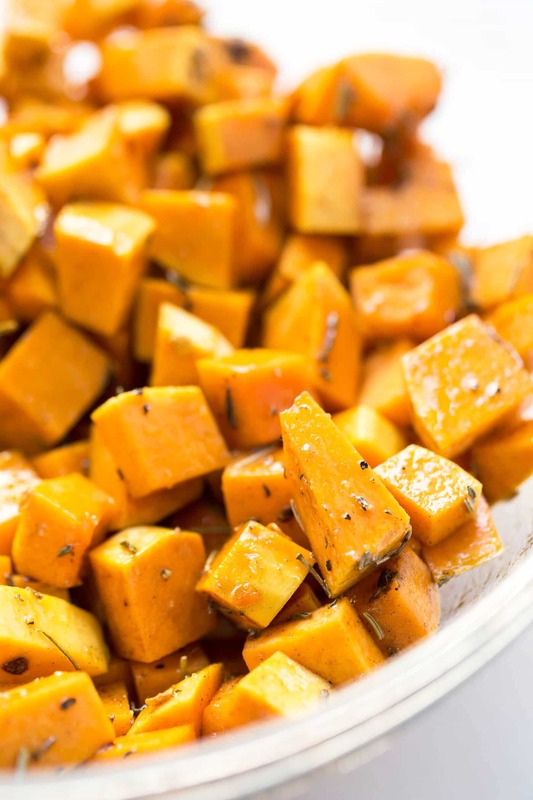 Toss your diced sweet potatoes (or squash), shallot and garlic in a large bowl. Add spices, salt and pepper, then drizzle with oil and toss to combine. Transfer to a baking sheet and roast for 15 - 20 minutes, flipping half way through. Serve cold or reheat slightly. This recipe is sponsored by Simply Organic! Thank you for supporting the companies that support SQ! I have a couple questions about your recipe. When you say “finely diced”, what method are you using to get your sweet potatoes down to less than 1/4 inch dice? I am having an issue with getting them that small safely. I am a chef and have a very good mandolin. Are you using a deli slicer? when you say “1 tsp of salt and pepper” is that a mix? what ratio? or is that 1 tsp of each? When using the fresh herbs as a garnish how are you getting your rosemary to not be ‘woody and stemmy’ did i miss read the recipe and should i have used the fresh herbs in the potato mixture? Due to the size and hardness of my potatoes which ended up being 1/2 inch dice. should i increase the cooking time for roasting? If so how long so that they are not still crunchy? With all the other crunchy materials used in this recipe and all the aromatics you are using. Should 1/2 cup chopped pecans be larger pieces so that they can be tasted? What sort of “chop” are we speaking of? is this a “broken pieces rough chop”? A fine chop? I am sorry if I am missing something in the preparation of this dish. Please feel free to email me so that I can better understand how this is supposed to go together. I like to cut my sweet potatoes into matchsticks (like fries) and then cut them into squares. I find that’s quite easy to get them small. For the salt and pepper, it’s each, not a mix 🙂 For the rosemary, you need to remove the leaves from the stem (which is how you’ll always use rosemary when stirring it into a recipe) and then finely chopping it. And yes, if you’re potatoes aren’t fully cooked, keep roasting! Pecans can be whatever size you want — it’s more about a texture than anything else. I like mine in a rough chop personally! Would this recipe be suitable for freezing? I haven’t tried, but I belive so! Could this dish be made a day ahead of time?? 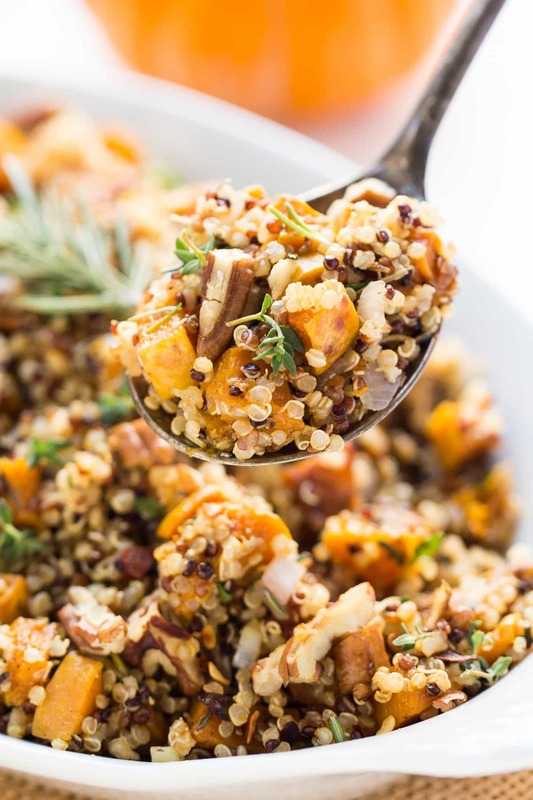 I’m fairly new to all of this, I only began eating quinoa about 6 weeks ago and I think this recipe sounds great to round out our first Thanksgiving à la healthy! I’m staying away from sweet potatoes, so do you think it would work with butternut squash just as well? If so, would I prepare it the same way? I think I will try walnuts too. Oh!!! THIS is “it”! Last week, somebody had this delicious quinoa dish at a concert reception, and we just adored it. I came surfing to find something similar, and this recipe is exactly what we had. So happy to find it, and it’s going to have a very welcome spot on our Thanksgiving table. 😀 Thank you for sharing. Well, I think a few ground walnuts and Brazil’s would see me having this as main item…. A good satay type sauce and pots of vegetables an that is me happy! I am pretty new to quinoa and was wondering what the difference is between red and white quinoa? Can this recipe use all white or all red quinoa? Thanks.